Wrinkle relaxant treatments is a safe and effective way to look and feel younger. 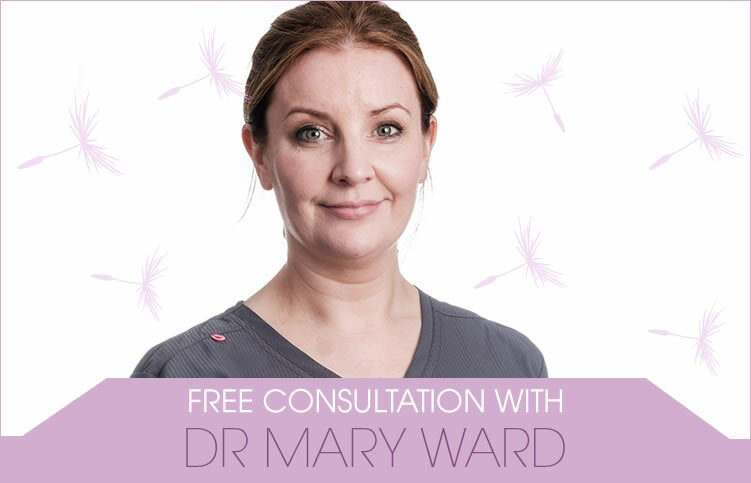 Dr Mary Ward is the resident Gracefield Skin Clinic expert, providing a full range of facial aesthetics including Botox (Azzulure) and Dermal Fillers for the lips and mouth creases. By injecting the muscles with the relaxant Dr Mary can reduce the appearance of wrinkles- especially those on your forehead, between the eyebrows (frown lines) and next to your eyes (crow’s feet). Special offer of €299 for 3 areas antiwrinkle treatment. Prices start at €180 for one facial area of Azzulre (Botox) and up to €350 for 3 areas. All fees includes a 2 week follow up review and top ups if required. I admit I was wary- I thought my face would freeze! Dr Mary Ward at Gracefield Dental took the time and explained everything to me. It was a wonderful decision that has really boosted my confidence. Everything about the process was so easy and practically painless. My skin is tighter and the wrinkles are practically gone! My wrinkles were aging me but after the treatment I looked and felt younger. It’s only a simple thing but it’s made a world of difference. WHAT IS A MUSCLE RELAXANT TREATMENT? The muscle relaxant we use is protein based and has been used for treating wrinkles since 1973. Small amounts of highly diluted muscle relaxant are injected into the muscle fibres that control facial features. When the tension is reduced the appearance of your wrinkles becomes less noticeable. The treatment is quick and easy and only takes a few minutes. The product is dissolved in a sterile saline solution and is injected with a very thin needle into the muscle. You may experience a slight tingling sensation during the injection but an anaesthetic is not necessary. The effects of muscle relaxant treatments can be seen three to five days after injection. They are at their peak after about 14 days, and remains for 3 to 6 months. Muscle relaxant treatments are not permanent wrinkle solutions so if you wish to extent the effect the treatment must be repeated. Also, if treatment is repeated before the effect is completely gone, it will ultimately last longer. WON’T MY WRINKLES GET WORSE WHEN IT WEARS OFF? No. Muscle relaxants have both a therapeutic and preventative effect on wrinkles. If you stop the treatment, the wrinkles will gradually become visible again just as they were before you started. Muscle relaxants have been used safely in the medical world for many years. It is approved by the FDA (Food and Drug Administration) in the United States and the long-term effects are well known. Despite its safety, it is very important that it be administered by a qualified physician.